Describes important experimental techniques to characterize the properties of self-assembled systems, particularly the nature of molecular organization and structure at the nano, meso or micro scales. Provides the first exhaustive accounting of self-assembly derived from various kinds of biomolecules including peptides, DNA and proteins. Outlines methods of synthesis and functionalization of self-assembled nanoparticles and the further self-assembly of the nanoparticles into one, two or three dimensional materials. Explores numerous potential applications of self-assembled structures including nanomedicine applications of drug delivery, imaging, molecular diagnostics and theranostics, and design of materials to specification such as smart responsive materials and self-healing materials. Highlights the unifying as well as contrasting features of self-assembly, as we move from surfactant molecules to nanoparticles. 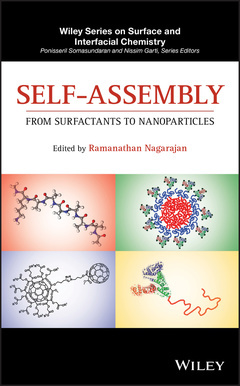 Written for students and academic and industrial scientists and engineers, by pioneers of the research field, Self-Assembly: From Surfactants to Nanoparticles is a comprehensive resource on diverse self-assembly systems, that is simultaneously introductory as well as the state of the art.